Civil rights leaders, community activists, social scientists and others will gather at ESF's Newcomb Campus Aug. 16 to discuss the need to broaden diversity in race, ethnicity, sexual orientation and gender identity among this enormous park's residents and visitors. A symposium titled Toward a More Diverse Adirondacks will feature an entire day of discussion about challenges to, and opportunities for, widening the pool of people who use, enjoy and care about the future of the largest park in the contiguous United States. 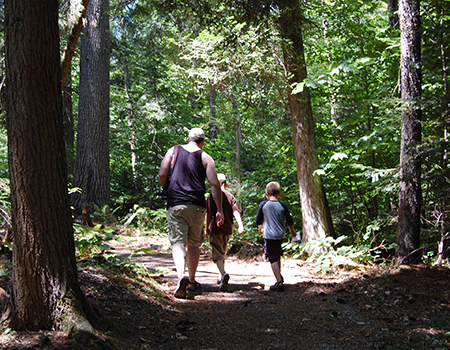 The daylong event is slated for Saturday, Aug. 16, at the Adirondack Interpretive Center. The conference will explore appropriate and effective approaches to attracting new Adirondack enthusiasts and raising the awareness of these issues and opportunities for those who already love the Adirondack Park. Participants will include social-justice activist, Adirondack native and seasonal resident Alice P. Green of Albany; Capital District outdoor educator Brother Yusuf Burgess; corporate diversity educator Brian McNaught; teacher, writer and social activist Pete Nelson; and multicultural travel writer/blogger Carol Cain; as well as representatives from a variety of Adirondack not-for-profit organizations. Keynote speaker Amy Godine will discuss how historic accounts of life in the park have affected its diversity as well as public perceptions of who belongs here. Registration begins at 8 a.m. with a welcome at 8:30 a.m. Programming runs through the day until closing remarks at 4:45 p.m. and a reception at 5 p.m. Registration ($20) is available online at the link above; participants can register by phone via the Adirondack Interpretive Center at 518-582-2000, or email aic@esf.edu. The registration fee includes lunch and the reception. Encompassing 9,300 square miles, the Adirondack Park is as big as the state of Vermont. Unlike most parks, it is designed to incorporate dozens of rural communities as well as commercial timberlands, farms and homes, which sit alongside millions of acres of state-protected, "forever wild" public forests. It is one of the only parks in the world where society is designed to live in harmony with nature. The Adirondack Park's year-round population is fewer than 135,000 people, or about one-quarter of Vermont's. More than 90 percent of the park's population is white, as are a vast majority of visitors. "Whether your primary interest is in the Adirondack Park's wild places or its rural communities, we need to broaden and diversify the group of people who care about this place," said Nelson, a frequent contributor to the "Adirondack Almanack" on the subject of diversity. "The racial and ethnic make-up of New York and the nation are changing much more rapidly than rural areas like the Adirondack Park. If the park's base of support doesn't change with the rest of New York, public attention and money will go elsewhere." "In our reality of climate change and growing cities, it is important that our inner-city youth have an opportunity to bond with the natural world to learn to love it, before being asked to heal its wounds," said Burgess, director of the Youth Ed-Venture & Nature Network and board member of John Brown Lives! "We want to help break down any barriers that are preventing people of all races, faiths, ethnicities, sexual orientations and backgrounds from enjoying this amazing place," said Adirondack Council Executive Director William C. Janeway. "We want people to know this is a park for everyone." "Having grown up in the park, and now as the mother of a young family, I fear we are at risk of raising another isolated generation without addressing this issue," said Cali Brooks, executive director of the Adirondack Foundation. "The issue of low diversity in the Adirondacks is something many of us have been aware of and working to improve for some time" said Paul Hai of ESF's Northern Forest Institute, "but what makes this symposium different, and the intent of the planning team behind it, is that this represents the first effort across the park to bring together in common conversation everyone interested in working on these challenges. Our hope is to foster an initiative going forward maximizing our collective efforts and creating a more welcoming and diverse park than we could have achieved individually." "I hope to help attendees see how we all might personally be perceived as not only welcoming of differences, but proactively courting diversity in the Adirondacks," said McNaught. "Do lesbian, gay, bisexual, and transgender (LGBT) people feel valued in the Adirondacks or merely tolerated and accommodated? We may think that because LGBT people live and work here, they must feel welcome, but do they really feel comfortable bringing their whole selves to social functions? What efforts have been made to publicly present the Adirondacks as eager to have LGBT people come here to live, work, and play? Do the gay and transgender youth in the park's schools feel safe? Do gay people in the state see the Adirondacks as the most friendly place to get married, to ski, to buy a second home? Does the Adirondacks want them to?" When it comes to both history and politics, perceptions can shape reality. So it is important to understand what is shaping those perceptions. "Adirondack history, written history, has never privileged diversity," notes Godine, an independent historian. "In fact, the old exceptionalist regional narrative has worked real hard to deny or undermine the diversity of the region -and the damage has been lasting. It's high time that narrative was challenged. This region has always been more inclusive than the written story shows." "The Forest Preserve exists at the pleasure of New York state voters," said Dave Mason of Adirondack Futures. "The direction of the state's demographics is starkly at variance with the park. If this remains the case for years to come, the risk is that the Forest Preserve and the park could become a largely abandoned, increasingly irrelevant and neglected backwater of the state with fewer residents and visitors than ever. This does not have to be our future, but it could turn out to be the default if we don't take some steps to address this." Partner organizations for the event include the "Adirondack Almanack," Adirondack Council, Adirondack Foundation, Adirondack Futures, Common Ground Alliance, John Brown Lives!, the Regional Office of Sustainable Tourism, ESF's Northern Forest Institute, and The Wild Center. Supporting organizations include the Adirondack Mountain Club, Adirondack Wild/Friends of the Forest Preserve, Newcomb Central School District, North Country Community College, Paul Smith's College, Protect the Adirondacks!, Riverkeeper and Ujima Journey of the Capital District.